The year 2018 has almost come to an end and it has been an amazing year for us at Kodular. Not only because it became more than a free-time project, but also because we (both Kodular and us) have grown in several ways. All of us have matured in several aspects, as running Kodular requires quite a big effort from our side. During these past months, we have learned a lot of things, but the one which is probably the most important is that we had to manage a company remotely. We, the team of Kodular, don’t have enough words to thank every single user for trusting us, for making this possible! 😊 Because Kodular is made by users, you have chosen how it progressed through our community. On this brink of a new beginning, we reflect back on the journey on how Kodular became what it is today. Let’s start from the very beginning. Kodular began one day in July 2017 (quite a long time, isn’t it? ), when a group of students 😃 wanted to start something on their own to explore and experiment and, most importantly, learn. Thus Kodular was born as a side project which would push our skills up to the best, excelling ourselves every time, working in our free time. Kodular (previously Makeroid) was first introduced to the public at Galicia Maker Faire 2017, where we were named the Makers of Merit 2017. In August 2017 we released the first public beta version. And we take this opportunity to acknowledge and thank all the users who have been with us, using Kodular from then. However, in January 2018, we hadn’t anticipated such an overwhelming response and success we received, and the next month we had to take one of the most difficult decisions so far: “Shutting down the public beta version of Kodular”. We couldn’t keep running the servers as we didn’t have the financial structure required to do so. During the next few months, we worked on making Kodular better, spending time every single day, preparing the “project” for its comeback. In May, Kodular was officially registered as a company, which aided us in bringing it to the next level. In the past few months, Sander and Mika added tons of new components to the Creator and several new blocks to already existing components. Vishwas redesigned the interface, making it cleaner and sleeker for users. We were also the first ones adding the most-wanted features from MIT App Inventor community thanks to Conor. Pavitra made an amazing work creating the Kodular Starter, and Sivagiri started writing Kodular Documentation for new users. And, I, Diego maintain the worldwide network of servers. Mentioned here are only a few of many areas of work we each have done, because our team works as a whole. All of us work on different areas of the project, helping one another, making this possible. Finally, on the 22nd of June 2018, Kodular was re-launched! 🎉 The support we got was awesome. It made us so proud as we knew all the work done so far was being appreciated. We kept working on it, and Kodular was growing (each day more than 100 users signed up to create apps with us). We take this moment to thank every single one of our users (yes! that’s you, thank you! ❤️), community members, extension developers, content creators and all others who have been a phenomenal support in making Kodular what it is today. 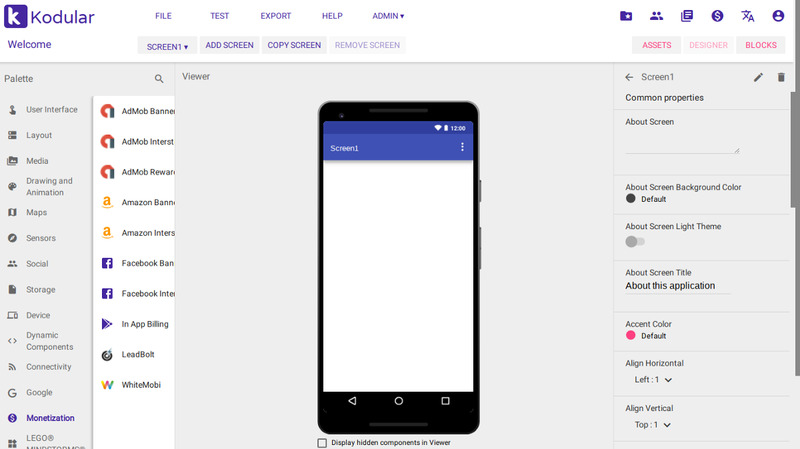 We wanted more, and we no longer offer ONLY a simple Android app creator without coding. 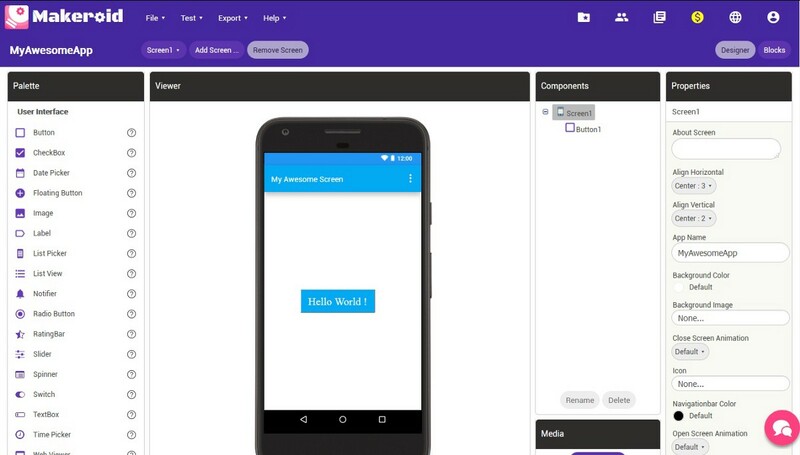 On 22nd of June along with the first production version of Kodular, Kodular Andromeda, we also released a free marketplace for apps, AIAs, screens and extensions, and an extensions IDE for advanced users to aid them in creating extensions. This made Kodular a complete suite for Android app development, and we keep will continue working on making it better. But not all that glitters is perfect. Probably, the hardest moment of the year was in October when we had to change our product name from Makeroid to Kodular. It was very difficult for us, we had gained a reputation so far and we didn’t want to lose it. But we knew we had to do it because, as MIT App Inventor Team is working on an iOS version, we also have to support it and Make_roid_ seemed to be linked with Android. Today, Kodular has around 80,000 registered users and nearly 200,000 projects at the Creator. This year our compilers processed more than 800,000 build requests! But what makes us prouder is that more than half a million (yeah, +500,000 😲) users use apps created with Kodular every day. Kodular has been covered by press several times this year, from newspapers to radio stations. That is a sign that what we are doing is great, we are helping people make their ideas a reality. That is one of the reasons why we offer Kodular Creator for free. We strongly believe programming should be made accessible to everyone and should not be something which requires days, weeks or months of learning. Everyone with an idea must be able to realise it and implement it in real life in a simple and a quick way. This is why Kodular was created. 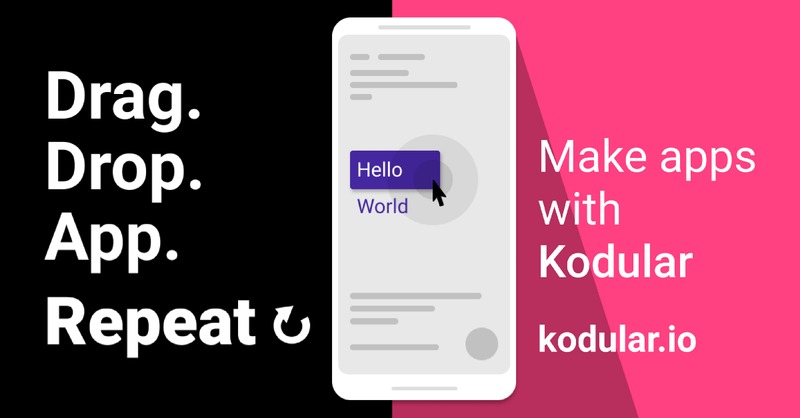 Kodular is no longer just an improved version of MIT App Inventor 2, Kodular has evolved into one of the best platforms to create and share apps. While I write this, I just take a look at what we have achieved, and one year ago none of us would have imagined we would go so far in just a year. Every single one of you have immense potential within yourselves that you might not have realised yet. You have got to keep trying, ’cause hardwork surely pays off. We have been covered by media thanks to our achievements, there are hundreds of tutorials about our platform on YouTube, and many high-schools use Kodular to teach introduction to programming. Thanks to every single one of our users who chose us to create their awesome apps. Thanks to everyone who connects every day to our community and helps new users in their coding adventure. Also, our ProKoders need a special acknowledgement for helping us debugging and fixing new features! 😊 Also, we would like to thank ArubaCloud for accepting us in their “We START you UP” program, providing us server infrastructure to run Kodular. Without them, the stability we offer wouldn’t be possible. P.S. : I can say in advance that next update will be on January, which will include a great announcement. It will also add several new components and a major update to Kodular Account. 😋 Stay tuned for updates! Cheers!